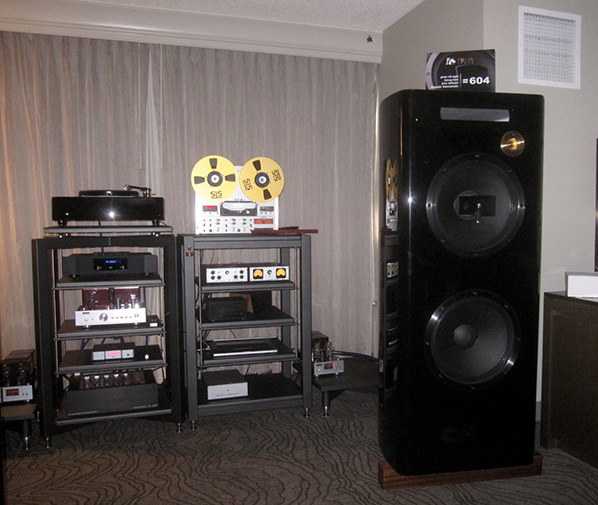 After a two-year hiatus, it was good to get back to Denver and check on the pulse of the high-end audio world. From what I saw, attendance was very good, with surprisingly more young enthusiasts than I had seen in years prior. I was still the lone 6moons wolf at this show so rather than attempt the Herculean task of writing up all the rooms, I again just report on rooms that stood out for sound quality, value or some other reason at my discretion. Apologies to exhibitors I didn't cover. See one of the other show reports (e.g. 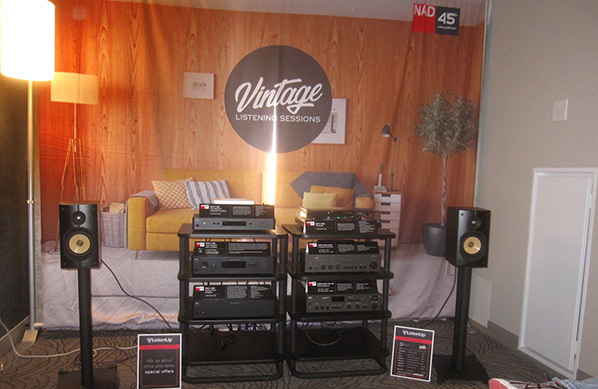 Stereophile, TAS, AVShowrooms, Part-Time Audiophile, Dagogo, Enjoy the Music, HiFi Pig, The Audio Traveler etc.) for any missing information on exact models or prices. While I am on this, wouldn't it make sense to have each room post their equipment list as a link on the RMAF website's exhibitor list so readers could simply refer to it there? It would save a lot of work for everyone. This year I trawled the aisles with my girlfriend Michele and my Connecticut Audio Society pal Phil Karlin. Phil is friends with one of the exhibitors in the Troy Audio room plus I had seen a preview of the room in a Facebook post so we both wanted to visit here first. The Troy Audio Hellena speakers ($100'000/pr) employ modern takes from Great Plains Audio on vintage Altec 604 duplex units. Mexican manufacturer Francisco Jileta incorporated the 15" 604-8K-III duplex with a 15" 416-8B woofer and Fostex horn tweeter all with AlNiCo magnets. This speaker was apparently finished just prior to the show. It was rather imposing, standing about five feet tall and weighing ~330lbs/ea.! Triode Corporation supplied the TRX-3 preamplifier and TRX-P3M 300B amplifiers (parallel 300B monoblocks of 20W). 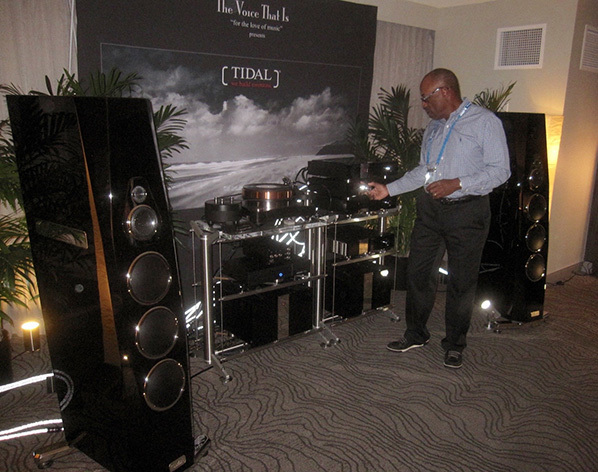 The speakers exceed 100dB sensitivity so the amps had no trouble driving them full range. Sources included 1/ a Garrard 301 turntable with Steve Dobbins plinth and Schröder CB tonearm, Ana Mighty Sound TNT15 Evolve MC cartridge (a modified EMT TSD15, see right), 2/ a Sonorus PR-99 tape deck with Cello/King tape head amp, 3/ a Metronome CD8s CD player with DiDiT DAC SE. Cables were by Zonotone, a name new to me. Francois Saint-Gerand represented the Ana Mighty Sound cartridges and was kind enough to show me a series of photos on his cell phone which showed their step-by-step cartridge repair procedure. They work on many different brands and the photos suggested fine workmanship. Francois showed great enthusiasm for his work and I really enjoyed his entertaining style while he headed up this room. At one point he put on a record and muttered softly "let's see if this drives people out" in mischievous jest. I laughed out loud as I found his music selections to be quite engaging. The system exhibited good dynamics and tonal balance and Francois' cartridge was revealing plenty of nuances. Owning a pair of vintage 604B Duplex, I'm a fan of vintage Altecs and liked what I heard. Although the Altec drivers are designed to limit dispersion to 60° for monitoring so side wall reflections are less of an issue, I would still love to hear what these might do in a larger room where they could be played louder. Last but not least, all of the exhibitors in this room were genuinely nice folks and I came back several times for both the sound and the inviting atmosphere. This room featured the debut of the new top-line LampizatOr Pacific. It seems like the previous top-of-the-line Golden Gate DAC got recently updated to make me wonder what GG owners will do now? I'd heard the first version of the Golden Gate as well as the Big 7 in a friend's system. Now the sound in this room suggested that the Pacific was a good jump up in LampizatOr DAC performance. The server was the matching LampizatOr Komputer and the amps were the LampizatOr balanced 211 amps at 60 watts (this version was specified for Kron 211 tubes). Even with the affordable Salk Sound Song 3 speakers at ~$6'000/pr, this room exhibited surprisingly good bass extension along with an easy sonorous quality throughout the entire range that drew me into the music. Image focus was excellent and there was good detail and soundstage depth, too. Recordings that were played while I was in were of exclusively audiophile quality (e.g., Jenna Mammina on Blue Coast DSD 256). Rooms that do this always leave me wondering how their systems would sound with the non-audiophile recordings most normal people will spin or stream..
Over the many years of my attendance at audio shows, I kept listening to the Lumen White speakers but was never able to warm to them. This year proved to be different. In fact I said so to the gentleman running the room who replied that Lumenwhite had done a lot of work to improve the Accuton ceramic drivers and that they had finally reached a pleasing result. The model on demo was the Kyara in French Nut finish at $49'900/pr. Ayon supplied all of the electronics: Orthos XS Gen.4 300W mono tube amps ($28'800/pr), Spheris III preamp ($34'500), CD-35 SACD player/streamer ($10'500) and the S-10 streamer/pre. Shelving was by BBS Audio Rack Systems ($4'995 for 3 tiers). The system exhibited very good dynamics with no harshness on the brass played in the demo cut (Fanfare for the Common Man?). My buddy Phil felt that the bass was slightly woolly but clean powerful bass is often difficult to achieve in the smaller show rooms like this. It's why many exhibitors wisely switched to smaller speakers. Congrats to Lumenwhite on the major improvements to their speakers. 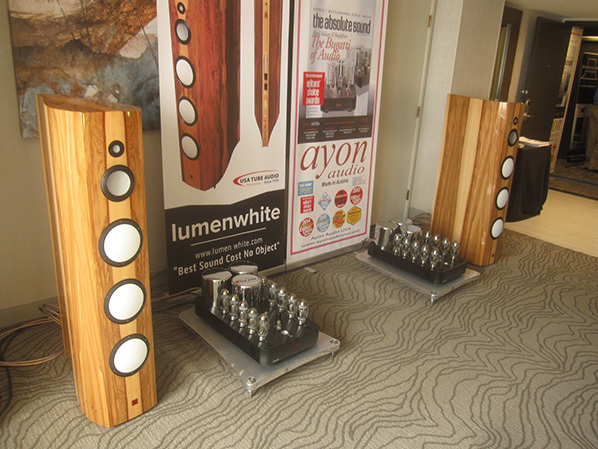 Obviously the Ayon products were playing a major role in their great sound as well. I've been a fan of Vinnie Rossi's products and Vinnie the man since his company started here in Connecticut and I did a 6moons tour of his manufacturing facility. His products have evolved tremendously and I have watched with admiration as he regularly comes up with true innovations in his product line. 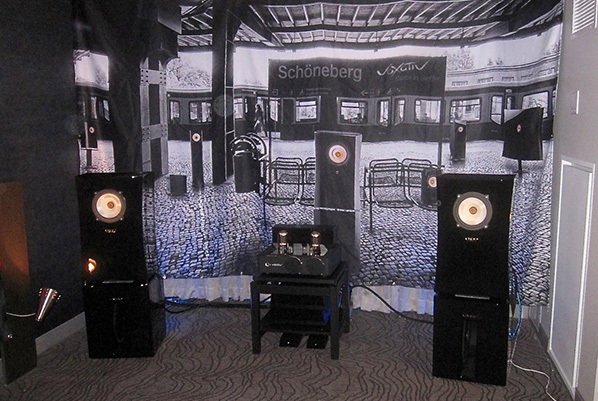 Since he dropped distribution of WLM speakers when WLM began offering electronics to compete with his own, he began showing with Volti Audio or Harbeth speakers. These demos have been unfailingly musical and always a pleasure. Vinnie used files from his MacBook Pro fed USB to his Lio super integrated which powered Harbeth 30.2 speakers. The Harbeth speakers are superbly musical and I can understand why they are an excellent choice for many but my tastes are better served by more dynamic widebanders. 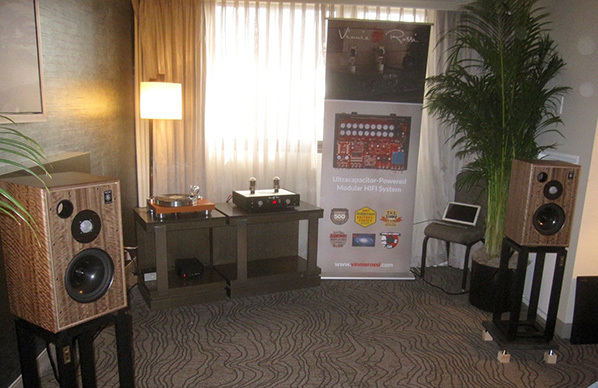 Still, for audiophiles in smaller rooms like this RMAF hotel room, the combination of Lio and Harbeth is great. This room had a number of products which I had my eyes on for quite some time. 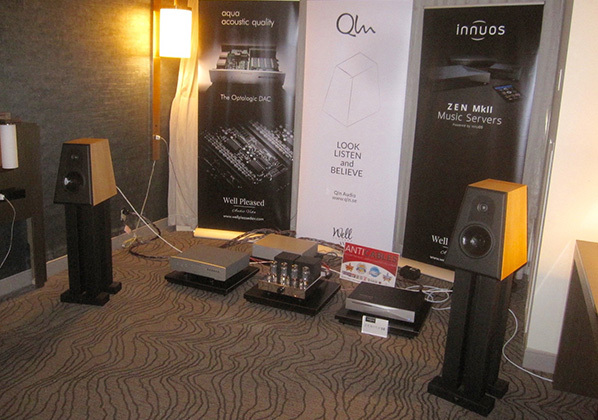 Foremost of these was the Aqua Acoustic Formula DAC ($14'700) which Srajan gave a Blue Moon Award to. Mark Sossa, the dealer running this room, informed me that the Formula DAC had undergone a recent firmware upgrade to process 768kHz. The Innuous servers were the other product that have intrigued me because they offer design features I value: Teac transport with automatic CD ripping, getting full album data and cover art from multiple online databases, ripping in the background while playing other files, playback from sonically superior SSD memory etc. Mark used the Innuous Zenith Mk. 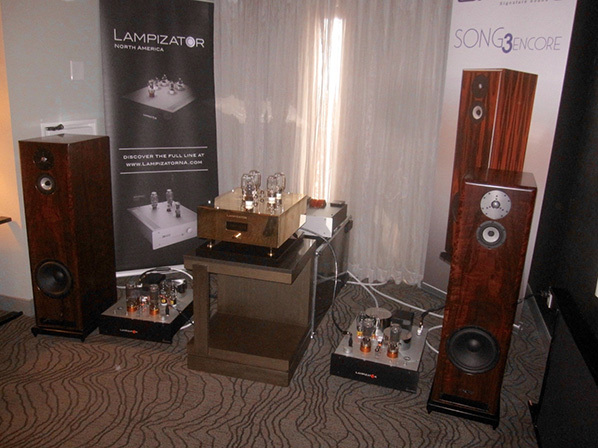 II SE top-of-the-line server ($7'000), the Audio-Hungary Qualiton A50i integrated tube amp ($7'500) and the QLN Signature 3 two-way stand-mounted speakers ($7'000/pr). Cabling was by Anticables and the power conditioner was from Tweek Geek. While I did a lot of talking with Mark in this room, I did hear a refined musical presentation and wish I had taken more time to focus on actual listening. Certainly Mark has made some very wise product selections. North Star Design was a familiar brand. A good friend owns their earlier transport and DAC and I have played them in my own system to good effect. North Star had a new DAC called Venti that utilizes the same chassis as their new Magnifico CD transport. The Supremo DAC was in use because the Venti was new and needed more break-in. One of the features I like about North Star digital components is their use of the superior I²S connection between transport and DAC. 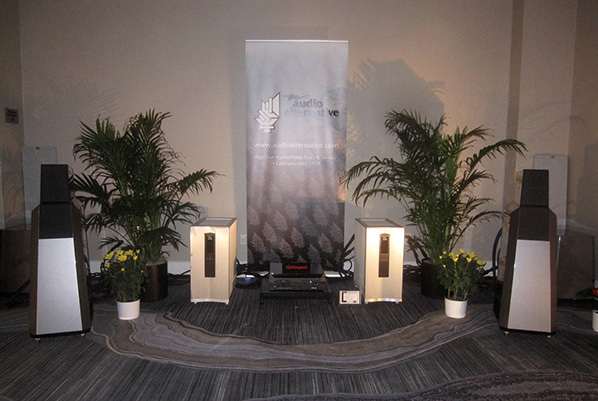 I was also familiar with the Rosso Fiorentino speakers from their previous distributor Avatar Acoustics. 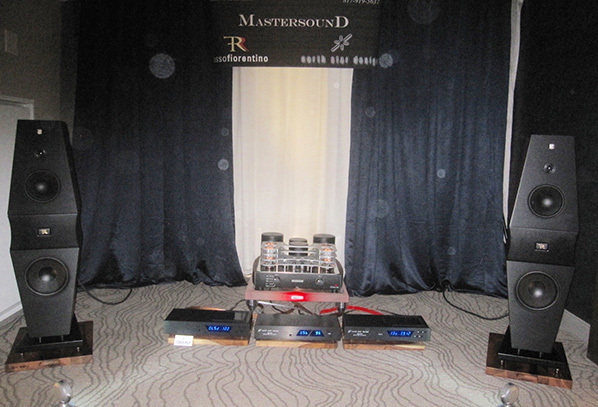 The full system included North Star Design Magnifico CD transport ($3'300), North Star Design Supremo DAC ($3'000), North Star Design Streamer (prototype), MasterSound Evolution 845 amp ($17'000), Rosso Fiorentino Volterra speakers ($11'500/pr) and Wireworld Cabling (roughly $2'000). I was told that what played when I walked in was "Sound of Silence"; I assumed a cover by the band Disturbed. Everything sounded fine until the louder passages where some hardness crept in. My past experience with these speakers as well as North Star products would not attribute such qualities to them so I emailed Derek Skipworth (Audio Thesis owner) about this after the show. He politely replied: "The hardness is in the recording itself but some of that may be attributed to the fact that the Volterra were still not completely broken in. RF speakers take quite a long time to fully break in." It can certainly be hard for dealers to have all of their ducks in a row for these shows and I look forward to hearing these products again. Akira speakers $215'000/pr; Presencio Reference preamplifier $77'900; Ferios mono amps $67'900/pr; Camira DMC DAC $28'500; Tidal power cords, XLR interconnects, USB cable and speaker cables; Antipodes DX Gen 3 server $7'750 - $17'200 (1TB - 8TB); TW-Acustic Raven Anniversary turntable $22'000; TW-Acustic 10.5 tonearm $5'490; Transfiguration Proteus cartridge $6'000; Dynamic Design Neutron SW16 Digital 1.5m power cord $7'500; StillPoints ESS Grid rack $12'100; StillPoints Ultra SS isolators $249/ea., StillPoints Ultra 6 isolators $899/ea., StillPoints Aperture panels $699-$749; Signal Projects Poseidon S40 power conditioner $11'000. Doug took time to explain some of the technology behind the Akira speakers, pointing at the 1.2" diamond tweeter and 5" diamond midrange that contributed mightily to the smooth and coherent sound. He was spinning vinyl and every selection, from classical to jazz (Johnny Hartman) was top notch. I was particularly impressed with the articulation of the system which did not exhibit even the slightest bit of sibilance or spurious artifacts to detract from the experience. Another noteworthy attribute was that the sound from the drivers held together seamlessly as the music rose or diminished in volume. In other words, there was a perceived linearity to the response which set this system apart from many others I heard at the show. Of course at these ambitious prices, you should expect so. Gamut really has their act together with their entire speaker line it would seem. I have now heard three of their four models and they have consistently sounded involving with a particularly full-bodied presentation that somehow renders all of the harmonics of instruments in a very natural and pleasing way. Lucky Dog HiFi had the following components in this system: Gamut M250i monoblock amplifiers, D3i preamplifier, Pear Audio Kid Thomas turntable with Cornet 2 tonearm and Gamut's new phone stage. A jazz selection from an Analogue Productions LP played and I was struck by the very realistic piano. It would be hard to go wrong with any Gamut speaker or their electronics and I get the feeling that the speakers are somewhat forgiving while still being quite revealing. They may not be in the über-revealing camp like Voxativ or some other single-driver speakers but then again, they probably mate well with a much wider range of electronics. "NAD designers have shunned conventional power-hungry linear power supplies and Class A/B output stages that waste nearly half the energy consumed as heat rather than sound. Instead, they have developed even better performing circuits based on switch-mode power supplies and Class D output stages." In other words, they save energy and money which is nice, but what about the sound? Of course there are some great class D amps but I think NAD missed the mark in their current attempt to provide good sound at an affordable price. There was a reverential hush that came over people when they entered this room, such was the powerful atmosphere of the operatic aria being played. 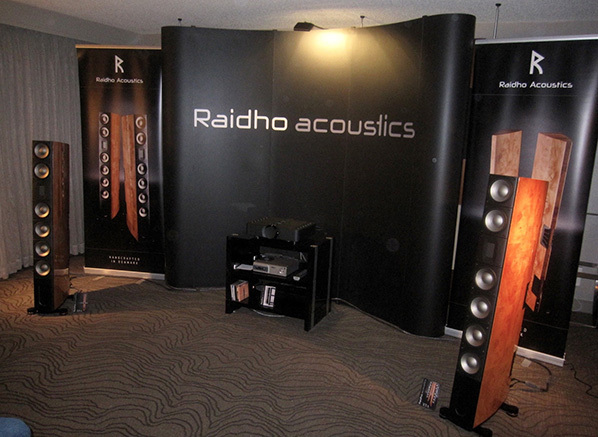 This was apparently the world premier of the Raidho XT-5 speakers (€39'600/pr) and they made quite a splash! In contrast to the bulging racks of electronics in many other rooms, fronting these speakers was the simplicity of the one-box handsomely designed Aavik U-300 integrated amplifier ($30'000) and Nagra CD player (plus cables of course). Finito! While Googling to find prices for this room, I came across a YouTube video uploaded by Suncoast Audio LLC that actually conveys some of the majesty of the sound in this room. Take a listen and then multiply by ten! This was a first-class operation all the way, with the Raidho rep dressed in a suit and pausing the music to give a stepwise explanation of the considerable technological prowess behind the manufacture of these special ceramic cones. There was a second Raidho room too, showing the smaller two-way Raidho D1.1. It was also mighty impressive. When someone asked about the efficiency of the speakers, the rep explained that they were not very efficient and that higher-powered solid-state amplification was recommended. He followed by saying that he used to be a tube amp guy but when he heard these speakers, he became convinced that he had to have them - even if it meant selling his tube amps. I must say that I can understand his thinking even though I have used nothing but tube equipment in my main system since 1987! Having owned a pair of Revel Ultima Studios, I was interested to see what kind of progress had been made to their line. On demo were Revel F228BE prototypes built into Revel F208 enclosures. 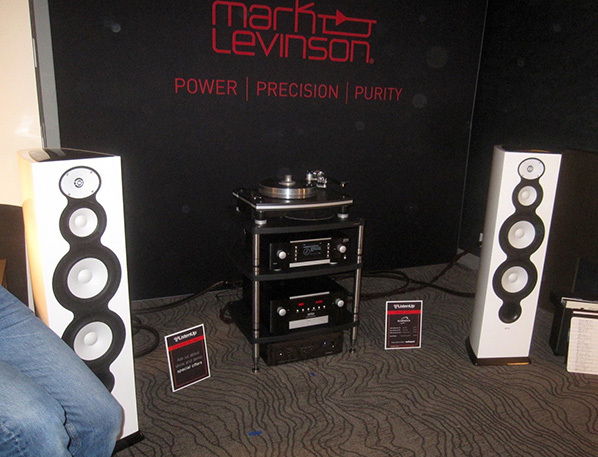 I also got my first glimpse of the new Mark Levinson 515 turntable ($10'000, manufactured by VPI with Levinson design cues). There was a Levinson 519 digital source player ($17'000) as well as a Levinson 585.5 integrated amplifier with phono module ($16'000). The venerable Kevin Voecks conducted the presentation and gave an excellent explanation of the concentrated team effort that went into the newly designed midrange and tweeter: ultra-low distortion motors with better linearity, improved heat transfer from the voice coil and a carefully designed wave guide for the tweeter to match dispersion with the midrange driver. He emphasized this matched dispersion as being paramount for the coherent sound between the two drivers. Indeed, there was no picking out the tweeter's presence when several digital tracks played. Bass performance was no less impressive as evidenced by a very interesting track from Boris Blank and Malia from the album Convergence. I still own a number of vintage Levinson preamps so it was heartening to see that Harman International are still pushing the envelope with their Levinson range. I was beginning to wonder for a while some years back..
John DeVore of DeVore Fidelity and Jonathan Halpern of Tone Imports have been collaborating at shows and elsewhere for a long time now. For my taste this may be the most satisfying sound I ever heard from any of their rooms to date. Equipment included a Spec GMP-8000EX turntable ($24'000); EMT JSD-S75 moving coil cartridge in EMT J-shell ($5'400); EMT 997 tonearm ($5'495); Sugden Masterclass PA-4 phono preamplifier ($2'500); Sugden Masterclass LA-4 line preamplifier and Sapphire FBA800 40wpc class A amplifier ($7'500); DeVore Fidelity Gibbon Super Nine speakers ($9,990/pr); Auditorium 23 RCA and XLR interconnects and speaker cables and Box Furniture Co. equipment stand ($4,'750). Apart from the expensive turntable, the other components were relatively affordable. Those who still subscribe to Ivor Tiefenbrun's philosophy about the higher priority of the source will be less ruffled by such a hierarchy. While I cannot comment on the relative contribution of the turntable, I can say that the system was supremely musical and one of my favorites. Having experienced a Sugden A21 integrated amp in my system, I can attest to the ability of this solid-state gear to avoid any lean or dry attributes that can sometimes be present with transistors. Years ago I auditioned the DeVore Nines in my system and chose the WLM LaScala speakers over them. However from what I heard now, I think John has made some major improvements with the new Super Nines (2 x 7-inch paper cone woofers, 0.75-inch treated textile dome tweeter, bandwidth 29Hz - 30kHz, impedance 8 ohms, sensitivity 91dB/W/M). That is a wide response for such a compact speaker. My listening notes include the comment "superb vocals" along with a very natural ease to the sound that would lend itself to long-term listening. The speakers were powered by the Voxativ T211 SET integrated amp ($19'900) and the source was a high-end DAC that had undergone modifications by Holger to here remain unnamed per request. As an owner of Bastanis Sagamartha Duo speakers being a high-efficiency augmented wideband fan myself, this system was right up my alley. You can forget all about any shouty quality from these speakers and with the seamless integration of the powered 99db bass units, this system pushed all of my hot buttons. The only thing I wish I had heard when visiting here would have been some highly dynamic orchestral music since this has been a traditional weakness of many widebanders. In any case, this room gets my vote as one of the best sounds of the show. Feeling a bit glazed over, I was almost ready to call it quits early Sunday afternoon when I gazed across the lobby and realized that I had somehow managed to mis the hallway with Audio Alternative. Luke Manley stood outside waving me in. I'm sure glad I accepted as this ended up being one of my other favourite rooms. The equipment list was quite extensive and formidable: Brinkmann Balance turntable with 12.1" tone arm and RöNt power supply ($32'080); Lyra Atlas phono cartridge ($11'995); Brinkmann Nyquist DAC ($18'000); VTL TP-6.5 Signature phonostage with MC step-up ($12'500); VTL TL-7.5 Series III Reference linestage and Siegfried Series II Reference monoblocks ($65'000); Vandersteen Model 7 Mk.II speakers ($62'000/pr); Vandersteen Sub Nine subwoofers ($18'900/ea. ), Audioquest Niagra power conditioners, Wild Blue Yonder cables and HRS audio stands. The total cost of this system was in the $500'000 neighborhood, too rich for my blood. I was lucky to be present during a comparison of vinyl and digital of the same performance. It was an unfamiliar audiophile Jazz recording. I also don't know if it was a modern recording where the master would almost surely have been a digital file. Even though I am an LP enthusiast, I must say that both were wonderful and preferring either one would be justifiable. The Acoustic Sounds LP of Dean Martin's Dream With Dean played next and it was stunning. This was the best vocal reproduction I heard at the show. Dean Martin's voice floated at realistic height and size right in the middle and it had a purity and fullness to it that was beyond reproach. My friend Charlie King prodded me to go hear this Vanatoo speaker system so I made this my last stop of the show. They had two rooms, one the designated Entry Level Room. The $500 digital system included the Vanatoo Transparent Zero speakers ($359/pr, 4" aluminium cone woofer, 1-inch soft dome tweeter, 4-inch passive radiator) plus a Polk subwoofer ($110) for a grand total of $469. This wouldn't even buy a cable in the Audio Alternative room. No source was included and they counted on you playing from your computer, phone, tablet or TV. A wired USB connection allowed for CD-quality playback and a Toslink connection supported up to 24/96. A digital amp built into the speaker sports connectivity on the back for the aforementioned sources as well as Bluetooth. The second Vanatoo room demoed their Transparent One speakers ($499) which are a slighter larger and more ambitious powered speakers. Either way, Vanatoo just became my go-to recommendation for any truly budget-conscious friend who asks for amazingly good sound for the money with all the connectivity a modern music lover demands.